Joining thousands of other law enforcement and community mourners, two Pelican Bay State Prison staff members representing the Department joined the December 8 tribute to four slain Washington State police officers who were shot to death by a wanted felon. The miles-long procession brought together law enforcement, firefighters lined up 30 rows deep. Officers from as far away as New York, Boston and Chicago attended the services. 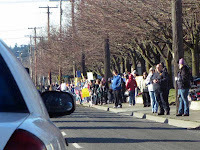 Many citizens braved 20-degree weather to line the streets, waiting for the procession to pass. The four officers were from the Lakewood Police Department, and investigators are still determining whether the suspect targeted the exact police officers or if he was targeting police in general. The deceased, Sgt. Mark Renninger and Officers Ronald Owens, Tina Griswold, and Greg Richards, lay in state in the Tacoma Dome. The four were killed on Nov. 29, 2009, while in a Parkland Coffee Shop preparing for their shifts.